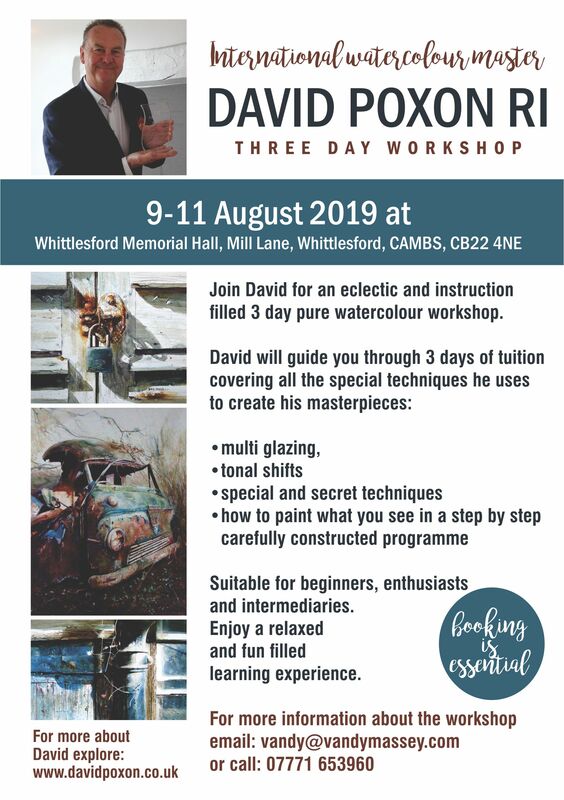 David Poxon RI is holding a three day watercolour workshop in Cambridgeshire in August 2019. The cost of this 3 day workshop is £285. This fee covers the cost of the tuition and venue. Attendees will need to bring their own art materials and a lunch for each day. Tea and coffee will be provided. If required, attendees will also have to arrange their own accommodation. There is a Holiday Inn Express in the village and some good local AirBnB hosts. There is a good train service from Cambridge and London which stops at Whittlesford Parkway station every half an hour. If you are coming by car, there is free off-road parking at the venue. David will provide a materials list which will be sent out approximately a fortnight before the workshop. Payment details will be sent out in the booking form confirmation.